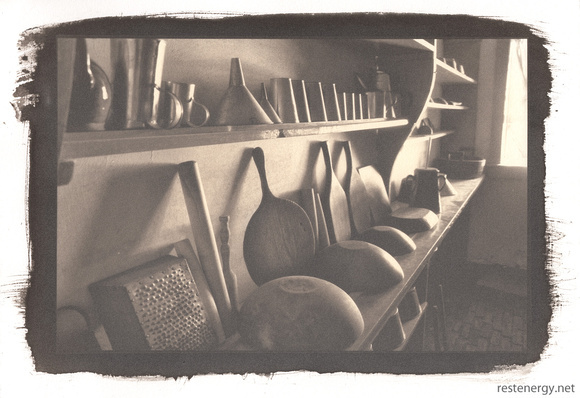 I’ve recently begun exploring antique photographic processes (also known as “alternative photographic processes”). These are historical methods of making photographs, and especially photographic prints. I’ve particularly latched onto the platinum print process. Platinum prints use platinum (now often mixed with palladium, the element directly above platinum on the periodic table) to form the image on the surface of the paper. The process creates beautiful prints with a great tonal range and a unique quality that is a bit difficult to describe, but which has long been prized by numerous photographers. Unlike the standard gelatin silver print we’re familiar with, platinum prints are true matte prints because the precious metal that makes the image is actually on and somewhat embedded in the paper, rather than on a gelatin emulsion applied to the paper. The platinum process dates to 1873, when British inventor William Willis took out a patent for the process. Over the next few years he improved it and began selling pre-coated papers. Platinum prints became an important means of making photographic prints for the next several decades, but the price of platinum had risen greatly by early in the 20th century, and then World War I led to constraints of supply and a need to devote available resources to war. Platinum printing died away, with a few devoted photographers continuing to use it. When World War II came, and wartime constraints intervened once again, very few were left using the process. In recent decades the process has seen something of a small revival. No doubt it is not only the visual appeal of these prints that has propelled this revival, but also the element of each print being a unique, hand-crafted expression in an era where the digital image, and its many advantages, dominate photography. 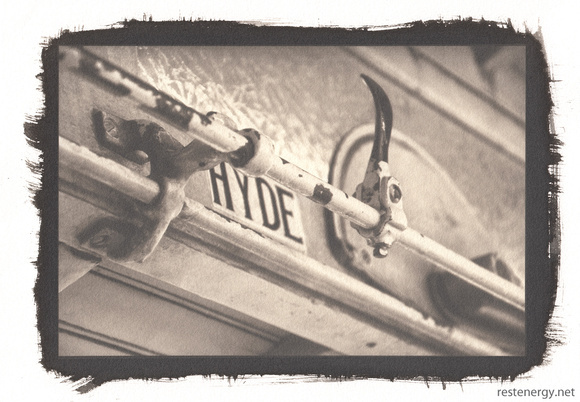 Besides their beauty, platinum prints have another interesting characteristic. They are the most archival of all photographic processes, since platinum (and palladium) are highly stable metals that do not corrode. The prints (if properly cleared and washed) will last as long as the high quality paper on which they are printed. My platinum prints start with a digital photograph. This offers many freedoms that the photographers of the platinum print’s heyday didn’t have. The digital darkroom allows for many possibilities of making adjustments that would be impossible or painstakingly difficult in completely analog photography. Further, the digital photographer making platinum prints has the advantage of being able to freely choose the size of one’s print. My digital photographs are processed and adjusted in the computer and then converted to a black and white image. I then print this as a negative image on a high quality ink-jet transparency, using a dedicated set of graduated shades of black capable of printing both black and white positive photographs on paper and negatives on film. Then it’s to the laboratory to make the actual print. In the lab, the paper is hand coated with a solution of a light-sensitive iron compound and platinum and palladium salts. This is spread across the surface by brush or a glass rod and allowed to dry. 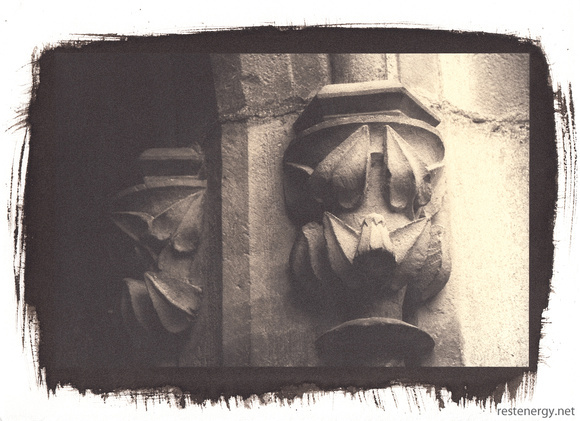 Once dry, the negative is placed on the coated paper and enclosed in a contact printing frame. This frame has a glass front and a hinged back held in place by large springs, keeping the negative and paper in place and in close contact with one another. The paper and negative are then exposed to ultraviolet light, either from an artificial source or the sun. All this can be done in subdued light, because the chemistry is sensitive to ultraviolet but not highly sensitive to most of the visual spectrum. Exposure times depend on the light source, the density of the negative, the particulars of the solution used, and so on. When removed from the printing frame, the paper is then developed. It is put in a clean, dry tray used only for developing platinum prints, and the developing solution is quickly poured over the paper. This causes a reaction between the iron compound changed by its reaction to light and reduces the platinum and palladium salts to pure elemental forms, which permanently embed themselves on and in the paper fibers. The more exposure to the light, the more metal is deposited on the paper, and the darker that portion of the image is. The print is then carefully cleared of all iron in a series of chemical baths and washed for 20-30 minutes with water before being hung up to dry. The result, if all went well, is a stunningly beautiful and unique monochromatic print which will last for hundreds of years.